I have known her since she was a kid. She used to hang around on the sets of Karisma's films. She was a very cute looking kid. We would sit together while Lolo (as Karisma is fondly called) gave her shot. 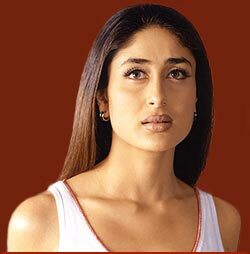 Even when Bebo (Kareena's pet name) was a kid, she knew she wanted to become an actress. We usually spoke about her school and stuff. I remember she was stunning at 15. Though she was slim, she was already into the 'I have to lose weight' chakkar. I had just lost some weight walking then, and she was like, "God, how I wish I could lose some too." Kareena, the person is very nice, loyal, friendly and sensitive. She does not throw starry nakhras. She is into listening to old songs and watching old films. She likes the element of grief and sadness in these films. She likes to wallow in them. She is not the kind to move on. She thrives on melancholy. The media makes her out to be this brat because she is her own person and says whatever is on her mind. She hates hypocrisy. What sets Kareena apart from others is her undeniable talent, her don't-care attitude and her commitment towards her profession which she has imbibed from Lolo. She is extremely close to her family and makes friends easily with those she works. She pairs well with anyone but I think Abhishek Bachchan and Tusshar Kapoor suit her best. Not Hrithik Roshan. Off all the films she has done, I like her most in Mujhe Kucch Kehna Hai because that is the way she is -- modern yet traditional, funny yet serious. She is just a little girl trying to find her way.